The Scylax is designed to make developments available in the mid to deep–water market at reduced building and operating costs by providing fit-for-purpose capabilities. The key is to focus on the essential functionality for deep-water drilling. Whereas ultra-deep water units feature ever increasing hook loads and capacities, these requirements can be reduced for a large amount of the wells in deep-water. Designing the Scylax based on these rationalised requirements allows for different choices to be made in the design, reducing building and operating costs. Designed around the drilling process, the Scylax provides deep water drilling in a compact design based on a single derrick or drilling mast set-up with off-line stand building, dual BOPs, up to 10,000-foot water depth capability and ample capacity mud systems. Drilling equipment packages of all major manufacturers can be readily integrated into the design. Signature GustoMSC design features, like maximised usable deck areas resulting from the integrated design and dedicated use, in-hull riser storage and in-hull mud and bulk systems and protected walkways, add to the operational safety and efficiency. 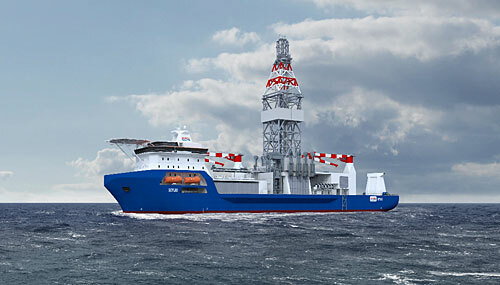 The Scylax design builds on GustoMSC’s track record in designing dedicated drillships. Signature GustoMSC design features, like maximised usable deck areas resulting from the integrated design and dedicated use, in-hull riser storage and in-hull mud and bulk systems and protected walkways, add to the operational safety and efficiency.